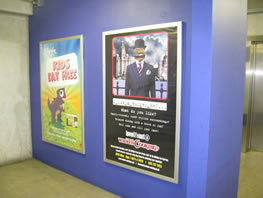 Liverpool Echo Arena offers advertising media opportunities to target 90,000 visitors a month! The Echo Arena opened in January 2008 with the launch event for Liverpool: European Capital of Culture and has since played host to a string of international events, including the MTV Europe Music Awards, BBC Sports Personality of the Year, Cirque du Soleil and Davis Cup tennis, plus concert performances from Elton John, Bob Dylan and Beyoncé. 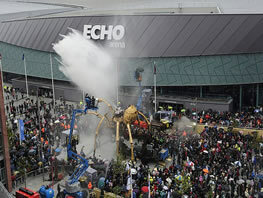 The Echo Arena stands at the heart of the development of Kings Waterfront, an iconic cultural legacy of Liverpool's year as European Capital of Culture in 2008. 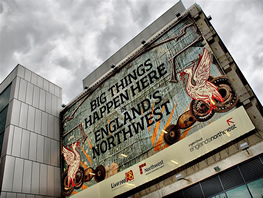 The award-winning facilities sit alongside the Grade I listed Albert Dock complex and World Heritage Site on the eastern bank of the river Mersey, in the heart of Liverpool city centre. 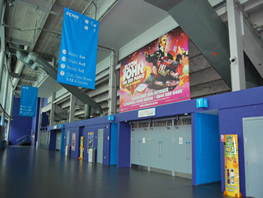 The multi storey car park provides a great opportunity to promote your business to customers at the point of arrival, with over 90,000 visitors walking through the car park each month, this provides businesses with an excellent opportunity to target a diverse audience from concert goers and conference delegates to general local tenants, employees and short break tourists. 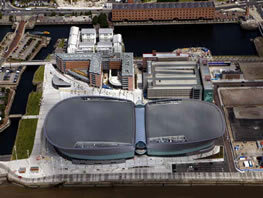 Echo Arena Liverpool has a 10,000 plus seated capacity with all wash rooms close to the seating areas. This offers a great opportunity to promote your business to our concert and event audiences. 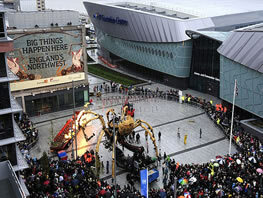 With approx 80 events to come in 2010 with top acts such as Beyonce, Pink, Andrea Bocelli and many more is an advertising must for all.